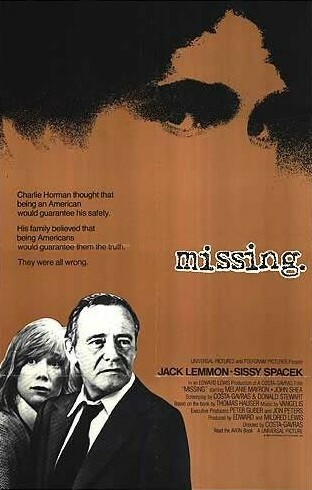 In 1982 the poignant Oscar-winning Costa Gavras movie Missing depicted the true story of two US citizens, Charles Horman and Frank Teruggi, seized and executed by the Chilean military after the September 1973 coup. The film focused on the disappearance of Horman, and the desperate attempts by his father and wife to find him in the face of cold indifference, and possible participation, of pro-coup US officials in Chile. Now, thirty-eight years after they were killed, a Chilean judge, Jorge Zepeda, has issued an indictment in the case that not only vindicates the premise of the film but appears to go well beyond it in asserting US complicity. On November 29 Zepeda indicted a Chilean intelligence officer, as well as the former head of the US Military Group, Navy Capt. Ray Davis, as accomplices to the murders. In a petition to the Chilean Supreme Court to authorize an extradition request, Zepeda stated that Davis was responsible for a “secret intelligence-gathering investigation of US citizens” in Chile. Information casting them as “extremists” was allegedly turned over to the intelligence branch of the Chilean High Command after the coup. Zepeda suggests that intelligence on Teruggi, including his address in Santiago, led to his detention on September 20, 1973. While the film postulated that Horman was detained because he had inadvertently stumbled across proof of US involvement in the coup, Zepeda’s investigation has produced a different scenario: the military believed that Horman was involved in “subversive” work with a Chilean government film company, Chile Films, that was under surveillance for its pro-Allende media activities. A declassified US document cited in the indictment speculated that Horman may have been killed because he was working on a film about the Allende government at the time of the coup. In its most chilling statement, the indictment alleges that Davis was in a position to “override the will” of the Chilean military to execute Horman—but chose not to do so. Captain Davis, as it tragically turns out, has advanced Alzheimer’s disease and is confined to a nursing home in Florida. There will be no extradition, nor will there likely be a courtroom verdict. But if—and it is a big if—the judge can produce evidence to back up his charges, he will finally provide a verdict of history on US complicity in the deaths of two of its young citizens in Chile. Henry KIssinger is alive and well. Time to indict him.